Comfortable - the GROHE Aquadimmer is an operating lever that allows choosing between the wall spout or hand shower and controls the flow rate at the same time. Safety – Temperature Adjustment prevents scalding especially around children. By varying the installation height of the hand shower holder, you influence how far the shower hoses reaches into the bathtub. To prevent drinking water from being sucked back into the pipe network (see EN 1717), an approved safety device must be fitted when installing a hand shower in combination with a bathtub. 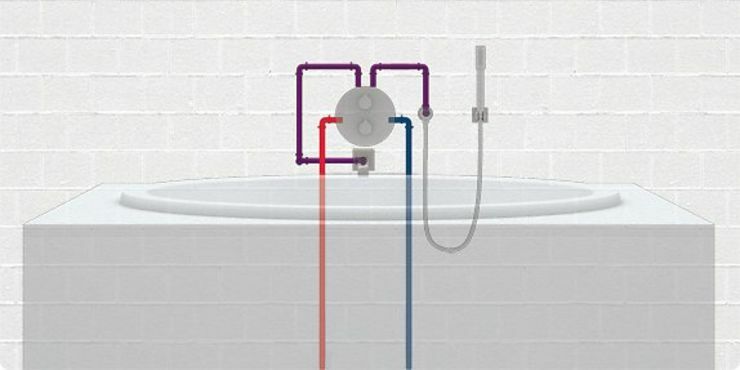 Such a device is available in the GROHE accessories range – product number 29 007 000. To ensure good functioning of this bath solution, a minimum of 7 l of hot/cold water are required per minute at a dynamic supply pressure of at least 1 bar ahead of the thermostat fitting. For faster filling of the bathtub, a higher flow rate is recommended. Please make sure that the water volume and the water pressure is adequate so as the waste is sufficiently be dimensioned.